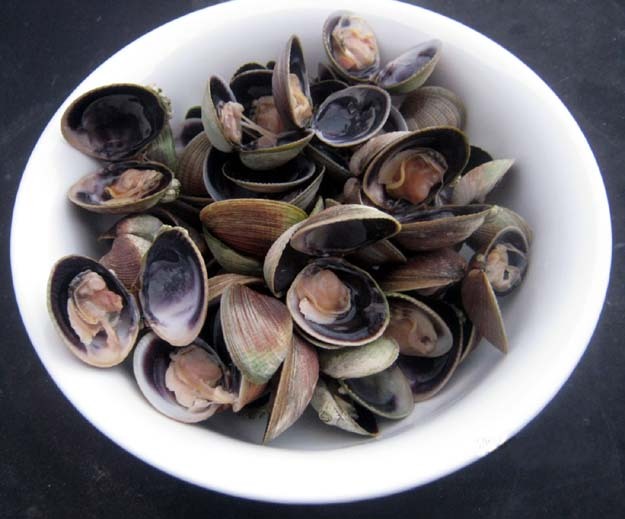 As a child raised in New Zealand, I enjoyed gathering and eating cockles whenever we stayed at our bach (kiwi for beach house). I moved to Australia and never gave cockles a thought, but way too many years later, and just a few months ago, I found cooked, frozen NZ littlenecks in a seafood shop. To say I got excited is an understatement, and I enjoyed my reunion with cockles that night and several times since. So naturally when we went to NZ in October and planned to spend a little time on the very south coast of the South Island, cockle hunting was on my list of things to do. On a cold windy morning on our way to visit cathedral caves, we stopped at Waikawa harbour and I struck cockle gold. The tide wasn’t out far enough, so I had to wade in ice cold water, but it was worth it (easy to say now). The numbers of baby cockles in the beds was staggering, I had read figures of 4500 per square metre, and now I believe it. Getting larger, eating size shellfish wasn’t quite as easy, possibly because of the tide. But I did get enough for a feed. Boiled until the shells opened and then dipped in vinegar is my preference, maybe because that’s how we ate them all those years ago. The meat is sweet and very tender. This time some were also used in a claypot casserole with fish, a few vegetables and rice. Superb!